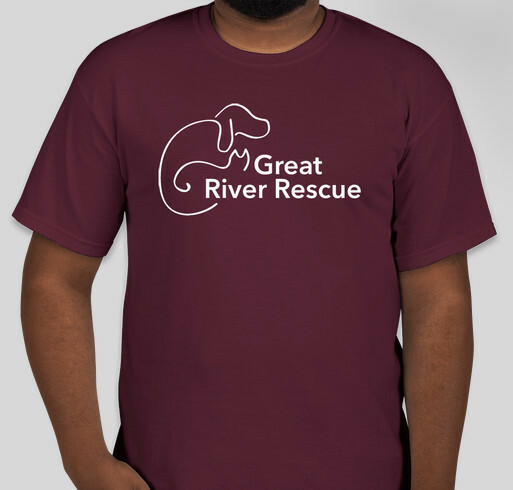 Purchase a specially designed Great River Rescue t-shirt to support our shelter and mission to save companion animals. All funds raised will go directly to Great River Rescue . Choose from six different t-shirt colors and styles. Order your shirts between February 1 and February 14 through our Customink.com fundraising page. Orders must be placed by February 14 at 11:59 pm. You can choose to have your order shipped directly to you, or you can pick up your order at Great River Rescue sometime in March. You will be notified when your shirts are ready for pick up. Proceeds from the sale of the shirts will directly benefit Great River Rescue. Each year, Great River Rescue saves, cares for and adopts about 400 companion dogs and cats. Every animal is given quality care, enrichment, and is spayed/neutered. Animals are placed in homes with loving and responsible owners. Additionally, Great River Rescue strives to educate the community about pet care and animal welfare related issues, and be a resource for their animal related needs. We are a community-driven nonprofit organization that can only continue its work with your support. GRR is a great facility - I’ve adopted two wonderful animals from this rescue. I’m glad they are apart of this community! Share Why You Support "Show Your Love 2019"